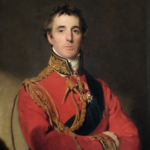 Arthur Wellesley was an Anglo-Irish soldier and statesman who was one of the leading military and political figures of 19th-century Britain. His defeat of Napoleon at the Battle of Waterloo in 1815 put him in the first rank of Britain’s military heroes. Wellesley was born in Dublin, into the Protestant Ascendancy in Ireland. He was commissioned as an ensign in the British Army in 1787, serving in Ireland as aide-de-camp to two successive Lords Lieutenant of Ireland. He was also elected as a Member of Parliament in the Irish House of Commons. "It is not the business of generals to shoot one another." "The Lord’s prayer contains the sum total of religion and morals." "Educate men without religion and you make of them but clever devils."